Cake perfection is right here. This Drunken Cherry cake is anything but ordinary. 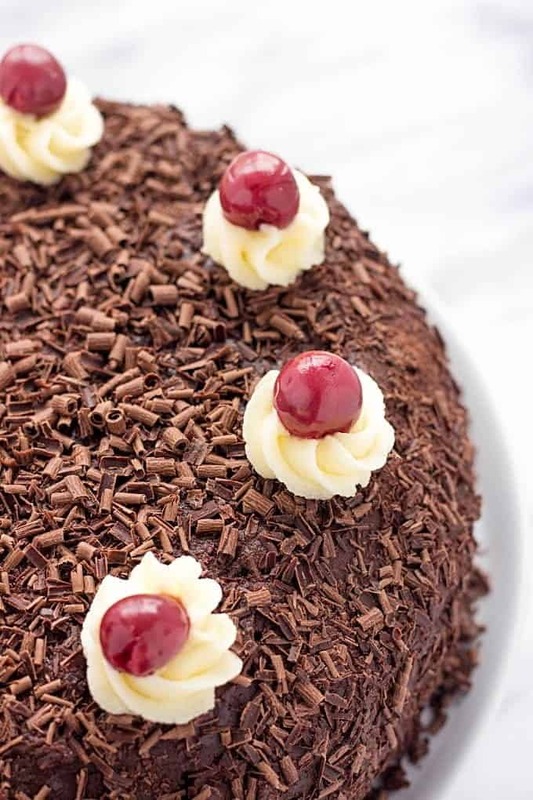 Moist, drenched in a decadent mixture of Dulce de Leche, cherries and rum, this out of this world cake will make you want to dance. 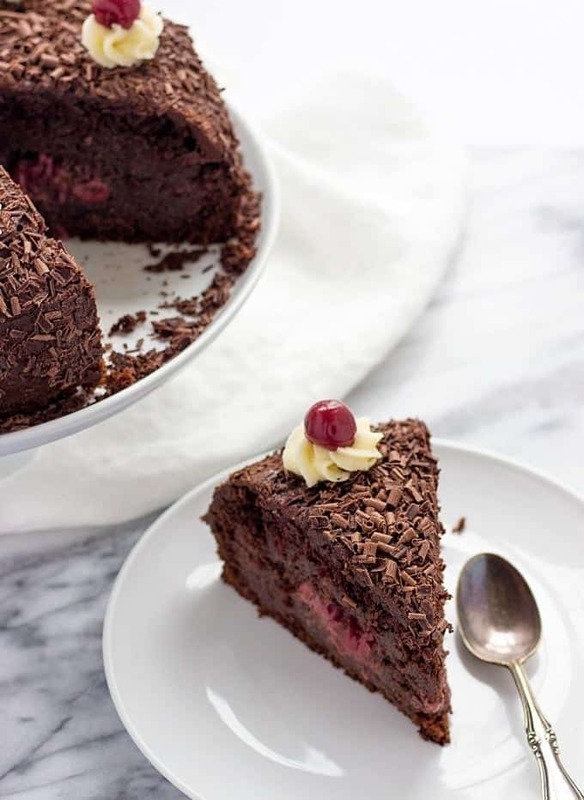 When it comes to dessert, you can’t go wrong with chocolate and cherries, aren’t you? This Drunken Cherry Cake has been one of my most favorite childhood desserts. The first time I tried it was at my aunt’s house. 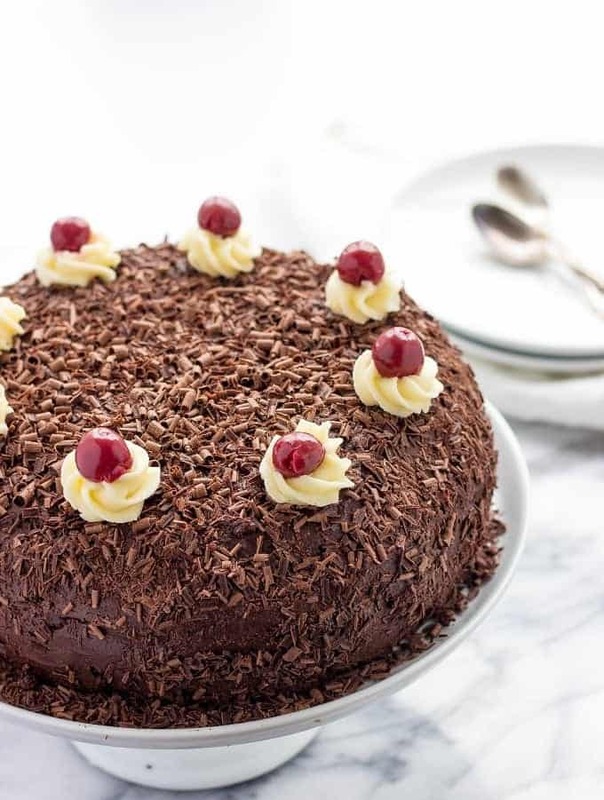 Now imagine a cake that is super reach, chocolaty, moist from Dulce de Leche and chock-full of cherries. It was definitely love at first bite kind of dessert. I didn’t hesitate to ask for the recipe and since then it became my most often cooked cake. The recipe never disappointed me and I enjoyed this delicious goodness on a regular basis. When I moved to the US, all of my favorite recipes were left back home in Ukraine. So when I attempted to recreate this beautiful cake, my first several attempts failed. And just like that the recipe was forgotten and since then I never tried to find a proper alternative because of my previous failed attempts. Everything changed after our trip to New York in November. My mother-in-law gave me a whole jar of cherries in syrup. After some consideration, I decided to give Drunken Cherry Cake another shot. To my greatest joy, the cake came out just as I remember it to be at my aunt’s house. Dulce de Leche makes it super moist and soaked in rum cherries give one of a kind zing that you never get tired of. This cake tastes even better on a second day. And if you’re making it for kids you can totally omit the alcohol part, cake will still taste amazingly delicious. Bring a medium pot of water to a boil. Remove the label from a can of condensed milk and carefully place a can into the water. Cook on a medium-low heat for 3 hours. Make sure the can is covered with water at all times. Remove from the water and cool before making a cake filling. Preheat the oven to 375 F. Line a round 9 inch cake pan with a parchment paper. In a large bowl, sift together flour, baking powder, baking soda, cocoa powder and sugar. In a medium bowl, lightly whisk the eggs. Add oil and milk. Mix well. Gently pour wet ingredients into the dry ingredients. The batter should be quite thick resembling a density of a sour cream. Splash in hot boiled water. Stir together until just combined and bake for about 1 hr 15 minutes or until a toothpick inserted in the middle of the cake comes out dry. Remove from the oven and transfer on a wire rack to cool. In a large mixing bowl, combine Dulce de Leche, cherries, cognac or rum and melted butter. Cut off the thin top layer of a cake and set aside. Carefully spoon out the inside of the cake and transfer it to Dulce de Leche mixture. Mix everything well. Make sure the borders and bottom of the cake are not less than ½ inch thick. 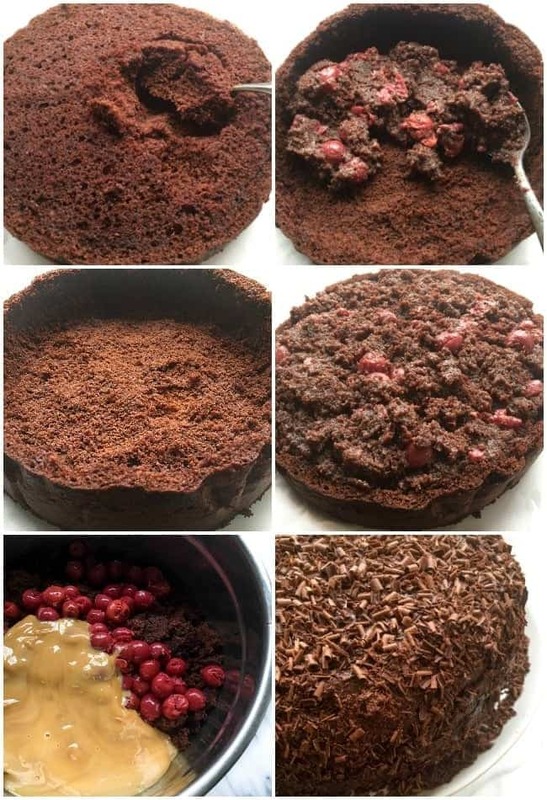 Fill the empty cake with the filling carefully pressing to fill in any gaps. Cover with a cake top and press again making sure not to break the cake top. Fill a medium pot with a few inches of water and put it on a medium heat. Place a heat-proof bowl over the pot with water and add butter. When butter has melted, add cocoa powder and confectioners' sugar. Whisk it all together. Add corn starch and mix until no lumps remain. Add chocolate and wait until it melts. Remove ganache from the heat and let it cool for a minute or two. Using a metal icing spatula, cover your cake with the ganache. Using a vegetable peeler, shave along the length of the chocolate bar to form chocolate curls. While ganache on a cake is still wet, scatter chocolate shavings all over the top and sides of the cake. In a medium bowl combine softened butter, sugar, vanilla and 1 tablespoon of milk. Using a hand electric mixer, beat the frosting on a medium speed until nice and smooth. Add the remaining tablespoon of milk until frosting is fluffy and smooth. Using 1M Wilton decorating tip, pipe 9 buttercream roses onto the cake. Garnish each rose with a cherry. *Dulce de Leche can be prepared a day in advance.